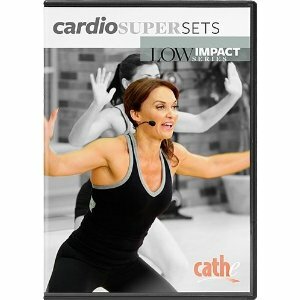 Cardio Supersets is part of Cathe’s Low Impact Series. I have had a lot of interest in Cathe’s Low Impact Series for a while, but have held off on purchasing any workouts in that series because a part of me thinks “low impact” equals low intensity. But since I’ve recently become obsessed with Cathe workouts, I decided to go for it and just get one to give it a whirl. The reviews all say that, in the case of Cathe at least, low impact definitely does not equal low intensity. The main workout is 42 minutes long but there are several pre-mixes and a bonus step routine. I decided to go straight to the Cardio Supersets Extreme premix which is 64 minutes long. (I did the Step Express premix as well so that I could review the bonus step routine; see that review below). The Cardio Supersets Extreme premix has all of the 8 supersets that are in the main workout, but it repeats 6 of the supersets for a total of 14 supersets. I was very impressed with this workout. This was a very intense workout. Much more so than I expected. Cardio Supersets Extreme is 64 minutes long; 6 minute warm up, 53 minute training period and 5 minute cool down. The warm up/cool down is the same for the main workout and the premixes, so you can just add/subtract from there (so the main workout training period is 31 minutes long). Equipment needed for Supersets Extreme (and the main 42 minute workout) is 8 pound dumbbells and gliding disks. The gliding disk are not absolutely necessary. I don’t own any, so I modify. However, the gliding disks are what make some of the moves low impact. I had to make them high impact in order to keep up the intensity. That wasn’t a big deal for me because I don’t have joint problems (nor do I mind high impact), but if the reason you want this workout (or workouts in this series) is for the low impact/high intensity aspect, then the disks are necessary. For the main workout, you would do the warm up followed by supersets 1-8 straight through, then end with the cool down. For the Supersets Extreme, after the warm up you do supersets 1-7, then do supersets 2-8 (so rounds 2-7 are repeated), and finish with the cool down. Each superset consists of two moves that are repeated. Superset 1: squat with 8 pound dumbbell with front kick and rotating shoulder press; repeat. Superset 2: kickboxing side kicks and push ups with alternate arm extension; repeat. Superset 3: sumo squats and aerobic lateral side lunge with leg lift; repeat. Superset 4: puddle jumps (I did skaters–the puddle jumps seemed a little too low intensity for me) and traveling planks with push ups; repeat. Superset 5: cross-country skiing on disks (I did the cross-country skiing w/out the disks which makes it a higher impact move) and fast prisoner squats; repeat. Superset 6: slow mountain climbers on disks (I just did plank mountain climbers) and side lunge with circle arms (use 8 pounds hand weight); repeat. Superset 7: 4 jumping jacks on disks alternated with 4 gliding lunges–still on disks (I just did regular jumping jacks and aerobic side lunges) and rotating squat with hammer curl (8 pound dumbbells), one foot on the disk. For this last move, you stay in squat as you rotate; also you bring the weights down nearly to the floor, then up into hammer curl as you rotate. Again, the disk isn’t needed. I suppose you rotate more smoothly with the disk? But it worked just fine w/out it. Repeat moves. Superset 8: momentum side lunges on disks (I did 180 jump lunges–obviously very high impact!) and a plank series on the disks–first you slide each leg out to the side while in plank, then you alternate sliding the legs to the side with sliding both feet into a sort of low impact squat thrust (I just kept my leg/foot off the ground when I brought it out to the side, then when you start alternating with the squat thrust, I just alternated with regular squat thrusts). Repeat the moves. There are two “express” premixes–one is the warm up/cool down with supersets 1-4 (26 minutes) and the other is warm up/cool down with supersets 5-8 (27 minutes). Step Express premix: 32 minutes; 6 minute warm up, 21 minute training time and 5 minute cool down. The step bonus is more what I expected from a “low impact” workout. It was lower in intensity than the non-step superset portion. It was a good workout and I actually enjoyed it quite a bit, but I would put it in the “recovery workout” category. The unexpected part of the step bonus was how basic the choreography was. I don’t do a ton of step these days, but back in my Firm days (5+ years ago) I did a lot of Firm step aerobics, some Kathy Smith and Gin Miller. I heard Cathe’s step workouts were very advanced, so I bought one (again–many, many years ago). The choreography was so complex I stood behind the step most of the workout, confused. I have never tried another Cathe step workout since (and sold that one via Amazon Markeplace! So now I cannot even remember which one it was!). That was one of the reasons I decided to do the Express Step premix separately–and on my rest day–because I didn’t want to ruin a good workout day by not being able to follow the workout. However, this was very basic step moves and easy to follow. So now I want to try more of Cathe’s step workouts! I don’t know which step workout is more representative of what is typical for her–this one, or the one I tried a million years ago. The bonus step portion is made up of 4 supersets, each superset is repeated. Superset #1: abductor lifts off the step–32 each side; step up, raise 8 pound weights over head, step off and do a back lunge–8 on each side. Repeat both moves. Superset #2: straddle then kick alternating each side then straddle and“push up” (with hands) while lifting leg back–lift and push up 3 times then straddle and do the same on the other side; burpee (hands on step) with push up (Cathe does burpee with disks–sliding instead of jumping back). Repeat all moves. Superset #3: Power 15 (leg lifts to the back–15 each side) followed by dynamic side leg lift; squat with knee raise and lateral raise using 5 pound dumbbells–12 on each side. Repeat all moves. Superset #4: lunge off each side of the step tapping the step with hands; tricep dip while touching opposite foot. Repeat both moves, at the end do a bunch of rapid tricep dips. There is also a Superset + Step premix that is 63 minutes long if you want to do it all–warm up/cool down, all 8 floor supersets and the 4 step supersets. Overall another awesome Cathe workout that I love. I will probably do Cardio Supersets Exteme the most but also I’ll sometimes do the main workout if I want something shorter, and sometimes the Superset + Step premix to mix things up. BTW–that is another thing I absolutely ADORE about Cathe workouts–is that she gives you so many options! 8/18/12 update: After some research on using the discs, I discovered there was more to it then merely making a move low impact (though that is one of the benefits). The discs recruit more and/or different muscle groups (depends on the move) and sometimes they make the move intense (and more difficult! ), other times just different. I experimented with the discs in some of my other Cathe workouts that use them and was very surprised, so the next time I did Cardio Supersets Extreme (this morning actually), I used the discs for every disc move and wow! Not only was it still just as intense, but in some aspects more so! (Like the cross country skiing move–big surprise for me to discover it works your legs and glutes more and differently then a regular high impact cross country skiing move.) I love this workout even more than I did before! So I definitely recommend the discs. Even if you’re like me and have no joint problems and don’t mind high impact–this adds diversity to your workouts and works muscles in a new way. A big thumbs up for disc work! Hello there I picked up this video and was wondering if you use this to burn calories? I understand the heart health but I need to get rid of this fat around my hips and stomach. Any cardio workout will burn calories. How many you burn depends on your fitness level. If you are a beginner then yes, this will probably burn a lot of calories but you if you are intermediate level or advanced then this workout won’t burn a ton of calories. Cathe has more advanced workouts for that. Her Afterburn is a good one if you want her low impact offerings. So is Crossfire, but it is not low impact. Those burn a lot more calories even for more advanced exercisers. I’m a complete novice and I get winded easy. Her warm ups wear me out. I brought that inane crossfire and made it through the first 4 core exercises then had to collapse on the rug. I love Crossfire! That is one of my favorite Cathe workouts. If you are new to working out, you might want to try an easier trainer. Jessica Smith is always a good pick. Her Walk Strong 1 is a better starting place for you.